Land Destroyer: The Greatest Way to Dishonor Martin Luther King Jr. The Greatest Way to Dishonor Martin Luther King Jr.
January 21, 2013 (LD) - What's the greatest way to dishonor Martin Luther King Jr.? Compare him with US President Barack Obama - a servant of an engine for the greatest disparity, inequality, and injustice on Earth - driven by the very corporate-financier interests King stood up against, was opposed by throughout his entire life, and most likely was killed by. For Martin Luther King Jr. - whose famous speeches still echo through the halls of time, who spoke a message of peace and of the importance of character over the mere color of one's skin - he is ironically compared to Barack Obama simply because of the color of their skin, despite the fact that these two men possess the opposite in character, and represent infinitely opposing causes. 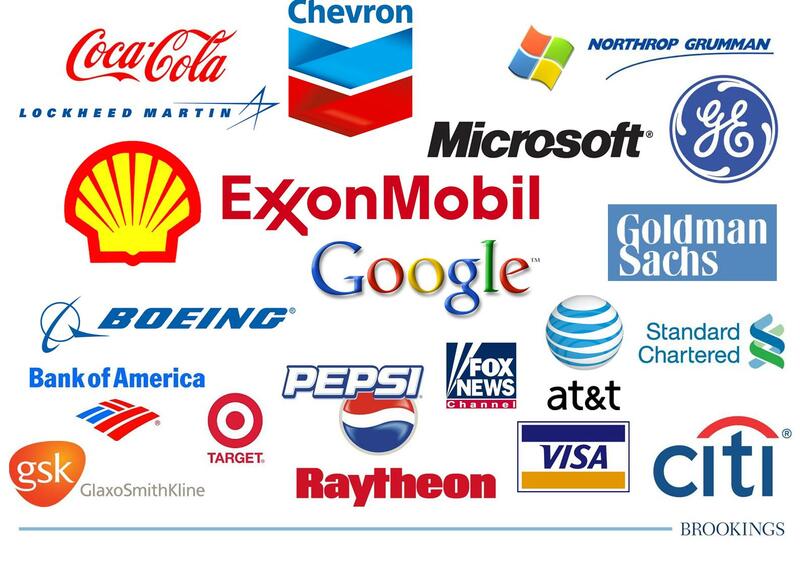 Image: A visual representation of the corporate-financier special interests represented by US President Barack Obama's cabinet, past and present. 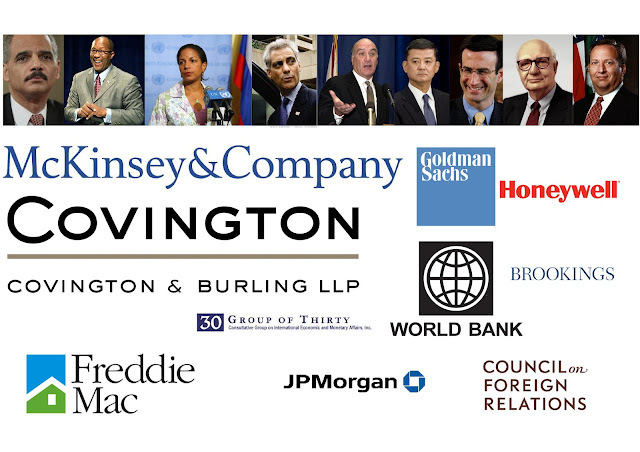 Of course, representation of the Council on Foreign Relations and the Brookings Institution (page 19, .pdf) should give any genuine left-leaning liberal pause for thought. These are think-tanks created by and for big business. The Brookings Institution in particular is home of the very architects of "George Bush's" myriad of wars - wars the faux-left in America claim Obama only grudgingly has been stuck with. In reality, his policy is driven by not only the exact same corporate-financier interests that drove Bush's, but in fact, many of the exact same individuals are writing the policy versus nations like Libya, Syria, and Iran today who were behind "Bush's" Iraq and Afghanistan wars - the consequences of which still are reverberating. This is what is called, "continuity of agenda," with the feigned political proclivities of both Bush and Obama being nothing more than carefully orchestrated theater to divide and distract the public as a singular agenda transcends presidencies and perceived political lines. And in reality, Martin Luther King Jr., should he still walk this world today, would undoubtedly be taking the podium and speaking out against this outrageous conspiracy against free humanity, and the affront to equality poseurs like President Barack Obama are attempting to foist upon the public and the world at large. He would undoubtedly condemn the global war Obama is waging from Mali to Libya, from Syria to Afghanistan and the borders of Pakistan, from Yemen to Somalia, to Uganda and beyond. In a speech given on April 4, 1967 in New York City titled, "Beyond Vietnam - A Time to Break Silence," King gives what is perhaps the widest encapsulation of his philosophy and worldview, one that would undoubtedly criticize and clash with the disingenuous US presidents of today, celebrating Martin Luther King Jr. Day. And the beauty of the equality King helped usher in is, the fact that Obama is black should not shield him from the criticism of the very man that helped pave the way for his accession to office. "It is with such activity in mind that the words of the late John F. Kennedy come back to haunt us. Five years ago he said, "Those who make peaceful revolution impossible will make violent revolution inevitable." Increasingly, by choice or by accident, this is the role our nation has taken, the role of those who make peaceful revolution impossible by refusing to give up the privileges and the pleasures that come from the immense profits of overseas investments. I am convinced that if we are to get on the right side of the world revolution, we as a nation must undergo a radical revolution of values. We must rapidly begin...we must rapidly begin the shift from a thing-oriented society to a person-oriented society. When machines and computers, profit motives and property rights, are considered more important than people, the giant triplets of racism, extreme materialism, and militarism are incapable of being conquered. A true revolution of values will soon cause us to question the fairness and justice of many of our past and present policies. On the one hand, we are called to play the Good Samaritan on life's roadside, but that will be only an initial act. One day we must come to see that the whole Jericho Road must be transformed so that men and women will not be constantly beaten and robbed as they make their journey on life's highway. True compassion is more than flinging a coin to a beggar. It comes to see that an edifice which produces beggars needs restructuring. A true revolution of values will soon look uneasily on the glaring contrast of poverty and wealth. With righteous indignation, it will look across the seas and see individual capitalists of the West investing huge sums of money in Asia, Africa, and South America, only to take the profits out with no concern for the social betterment of the countries, and say, "This is not just." It will look at our alliance with the landed gentry of South America and say, "This is not just." The Western arrogance of feeling that it has everything to teach others and nothing to learn from them is not just. This kind of positive revolution of values is our best defense against communism. War is not the answer. Communism will never be defeated by the use of atomic bombs or nuclear weapons. Let us not join those who shout war and, through their misguided passions, urge the United States to relinquish its participation in the United Nations. These are days which demand wise restraint and calm reasonableness. We must not engage in a negative anticommunism, but rather in a positive thrust for democracy, realizing that our greatest defense against communism is to take offensive action in behalf of justice. We must with positive action seek to remove those conditions of poverty, insecurity, and injustice, which are the fertile soil in which the seed of communism grows and develops." It is safe to say that America has not mended its ways and only traveled further down the dark path King warned us of back in 1967. The man "leading" us, or at least the front-man for the corporate-financier interests that drive America's destiny, may honor King with carefully contrived words and well orchestrated public stunts, but in deeds and actions Obama and the corporate-financier elite that hold his leash, defame and dishonor King in every way imaginable. If you want to honor King and his life's work, honor it by implementing the words he uttered while alive, not by playing along with a system that resisted him until his death, and has since dishonored and exploited his memory with disingenuous praise while maliciously carrying out an agenda contra to everything King ever stood for. You can read and listen to the whole April 4, 1967 speech, "Beyond Vietnam - A Time to Break Silence" on AmericanRhetoric.com.